As I began to do the research on Christmas celebrations during World War II, I realized that I remembered many of the things we did during those days because of the rationing. I was so young, however, that I didn't understand it was because of the rationing. That's just how one did things. 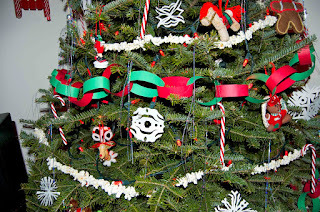 I can remember making red and green construction paper chains at Sunday School to put on the rather scrawny Christmas tree. We always had a real tree, but I don't remember if my dad cut it himself or if we purchased one. Trees were fairly scarce as labor to cut the trees was scarce as well. The men were gone to war. We also strung popcorn and cranberries to make garlands for the tree. It was great fun for the children. We had no idea of the turmoil going on across the ocean. I had forgotten all about this, but reading the research I ran across what folks did during the war to make "snow." They would make a mixture of Ivory Snow laundry detergent and water and whip it until it was light and fluffy. Then they would decorate windows and even Christmas trees with it. I remember flinging the white concoction onto the tree to make it look like it had been in a snow fall. As it dried, it formed a thin crust and lasted through the holidays. One thing that was really different than today for our family was that the stockings we hung were just plain old socks, not the fancy jeweled, furry ones we hang today. 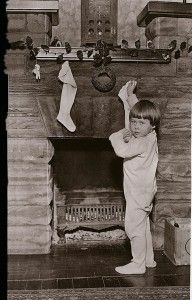 And when we awoke Christmas morning the stockings were filled, not with games, toiletries, and electronic gadgets, but with oranges, candy, and nuts. Fresh fruit was a luxury in those days. Christmas dinner was much less abundant than today, but it was festive nonetheless. I remember we usually had a roast hen, and stuffing that I did not like at all. We lived in Indiana at the time, and the dressing was this gray, gummy dish. Not until we moved to Texas and I was introduced to cornbread dressing in the school cafeteria did I like dressing. During the holidays, my mom always made a candy made out of potatoes, which was a fondant kind of candy with a chocolate topping. I'm sure she saved ration cards for chocolate for months to be able to make the candy. were thrilled! Christmas didn't seem to be so much about presents and things then, as it was being with family and loved ones. Many Christmas dinner tables in our small town had empty places during those years. I remember opening the door one wintry evening and seeing a tall, handsome, grinning sailor standing in the doorway. It was my Uncle George, and he was home from the war. That was the best Christmas present of all! I wasn't around during that time, but I know things were leaner during the war days. I have one of my mom's ration books. We've celebrated several Christmases with one of our sons on deployment, and it's always bittersweet. My grandparents both sides nor my parents ever talked about what effects WWII had on them. Like I said, some of those things I'd forgotten until I started doing the research. Then it jogged my memory. Enjoyed your post, Golden - thank you!! 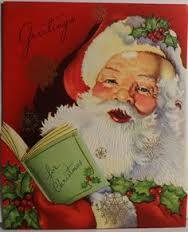 It brought back memories of Christmas with my grandparents, I was born Dec. 25th, 1943 - at home. Christmas observance in my household, as a child, was much the same as yours. The men in my family were all farmers, none served in WWII (although other relatives did) - my grandfather served in WWI, my brother served in the Vietnam War, my chaplain nephew served in Afghanistan. I wasn't born then but I've heard my grandmother and mother-in-law talk about the rationing. Thanks for an interesting post and Merry Christmas!